Have you ever noticed the "reverse-boy-who-cried-wolf" phenomenon, when normally serious people tell jokes and nobody gets them? Are recent fashion trends in Japan sophisticated artistic expression, or just gaudy over-decoration? 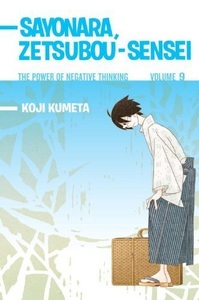 Zetsubou-sensei loses his job, his freedom, and... his glasses?! To top it off, the students of class 2-F are informed that they will all be held back in the eleventh grade - again.